We absolutely love working with business of all shapes and sizes to schedule on-site corporate chair massage services for events, meetings, or even as a well-deserved reward for employees or customers. In addition to being an enormously valuable relaxation tool, Corporate Chair Massage 2 corporate chair massage can also be an entirely effective rehabilitation tool as well. If you are a business owner, employer or employee in or around the Scottsdale or Phoenix Arizona, Las Vegas or Southern California areas, then we can and want to work with you too! According to The American Journal of Epidemiology, 86% of the American workforce spends approximately 7.7 hours per day sitting down. Whether being seated or else just in a postural position that inhibits the natural, dynamic and fluidly flexible movement patterns native to the human body, extended periods of inactivity have been clinically proven to increase incidents of mental, emotional and physical ailments and illnesses. 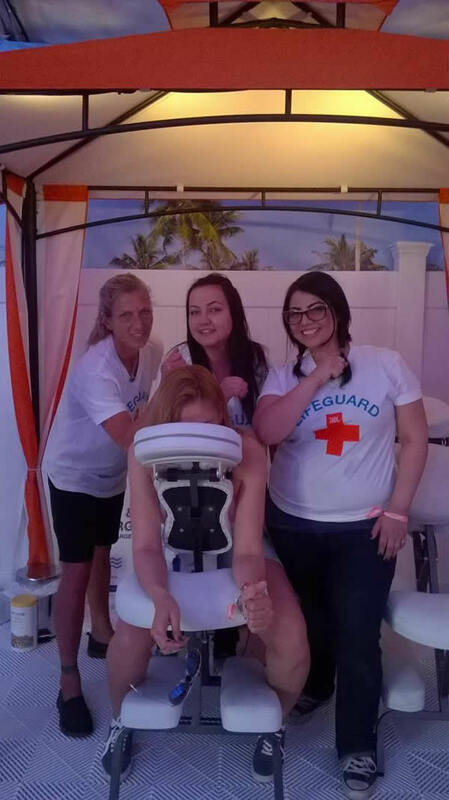 .Combat this decrease while increasing morale, health, and wellness—by demonstrating employee appreciation with an on-site corporate chair massage event! These events work especially well in a public setting because clients can remain fully clothed. And since each individual chair session only lasts for 10-30 minutes, it is ideal for sharing the minimum 2-hour scheduled time per mobile therapist. Within that hour, you can have between 4-6 of your deserving employees pampered. 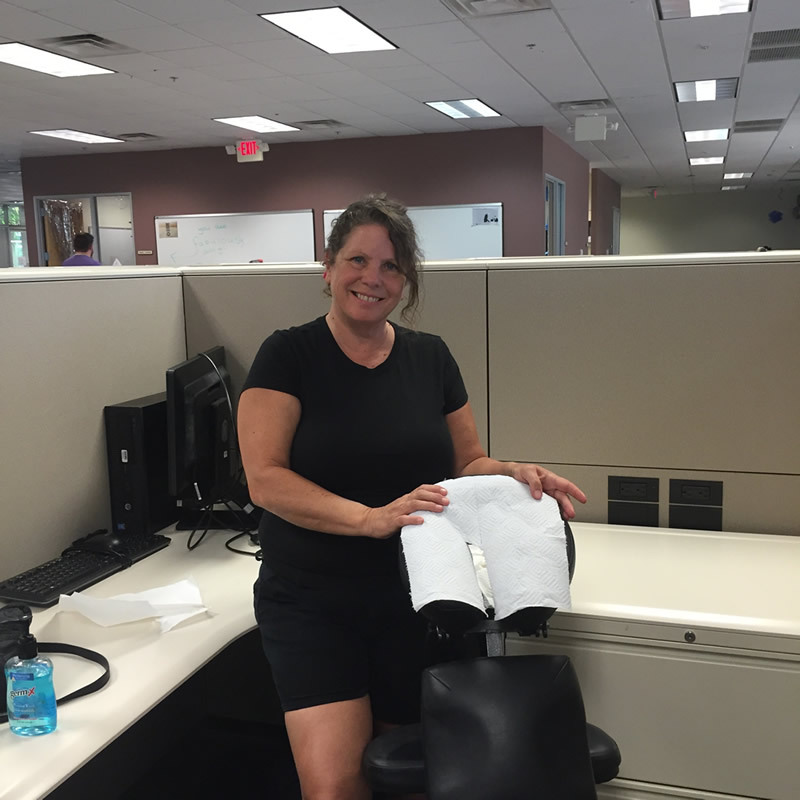 The chairs our therapists bring are small, unobtrusive, and can fit in an out-of-the-way area like a corner, conference room or even a cubicle. On-site services are perfect for a company party, during the lunch break of an all-day meeting, during the holiday rush, or just as a thoughtful ‘Thank You’ for a job well done. These events will lift morale, energize your staff, increase productivity, relieve stress, and contribute to overall good health and wellbeing. And think of this: What better way to increase traffic and customer loyalty/appreciation for any goods or service-based retail business, than hosting an event for incoming customers as well as hardworking staff members? If you reside in or around the Scottsdale or Phoenix Arizona, Las Vegas or Southern California areas, please do not hesitate to contact us to learn more about on-site corporate events—as well as to ask about regularly scheduled on-site Corporate Chair Massage 1 sessions that can work around you and your employee’s hectic schedules. These simple, on-site sessions can be scheduled weekly, monthly, or just for special events such as holiday parties. We can provide the signup sheet, and please remember that a minimum 1-hour session per therapist must be guaranteed. Our large, highly experienced, professional and courteous staff of mobile therapists love to work with your entire corporate party. And with a staff of over 40 therapists, we can accommodate events of all sizes. In addition, we also offer add-ons including spa treatments, personal chef services, and even live music coordination, in order to make your entire corporate event as relaxing, entertaining and fun as humanly possible. Trust the experts at A Magic Touch to help facilitate an event you and your employees, customers, and every other guest will never, ever forget!